Ever been to the farmer’s market, SDCC or even more recently, MondoCon and you are taking pictures, videos and texting like a madman, or madwoman, only to have your phone’s battery crap out on you? Then you are at the mercy of the venue as you look for a wall outlet to plug into and recharge. You miss out getting in line and BAM, your favorite print is gone and you are left without amazing art OR the ability to complain about it via your phone! Well you’ll never have to worry about that again with this incredibly tasty new charger called The Battery Buddy. Why “tasty” you ask? Well for starters, it is available in 3 colors: Latte Brown, Sweet Strawberry and Kale Green. 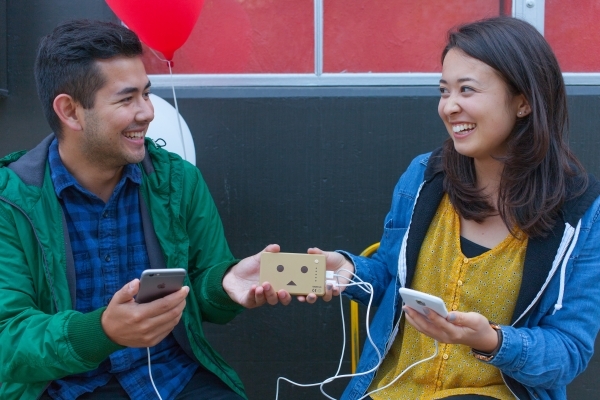 These lil’ life savers will charge your phone up to 5 times off one charge! To make these cute gadgets even MORE appealing they have two, yep TWO, USB ports so you can charge not one but MULTIPLE devices at the same time! 4.5 x 3 x 1 inches. Just about the size of a deck of cards! CLICK HERE to purchase your very own Battery Buddy and NEVER worry about charging your phone ever again! This entry was posted in Accessories, Gadgets, Tech and tagged Battery Buddy, dual USB ports, phone charger. Bookmark the permalink.